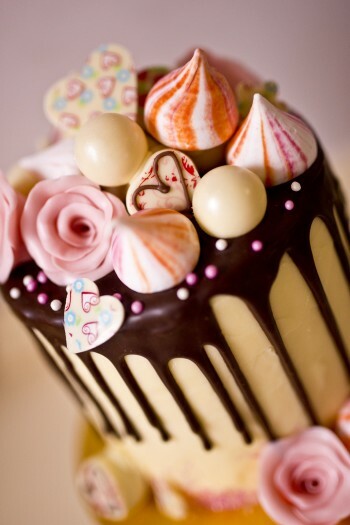 The cake is covered in white chocolate truffle ganache with a drizzle of glossy milk chocolate ganache and decorated with beautiful chocolate roses, colourful meringues, strawberry champagne truffles and white chocolate pearls. So pretty! Cake Filling: Buttermilk (milk), hydrogenated vegetable oil, vegetable oil, buttermilk powder (milk), modified maize starch, emulsifiers (sucrose esters of fatty acids, mono and diglycerides of fatty acids, soya lecithin), stabilisers (Guar gum, locust bean gum) White Chocolate Min 29% cocoa solids: Sugar, cocoa butter, whole milk powder, emulsifier: soya lecithin, vanillin. Sugar, Butter (milk), Lemon Curd (Sugar, pasturied whole egg, margarine (vegetable oil (non hydrogenated) palm oil, Palm kernel oil, Rapeseed oil, water, salt, natural flavouring), lemon juice (16%), Vanilla extract.